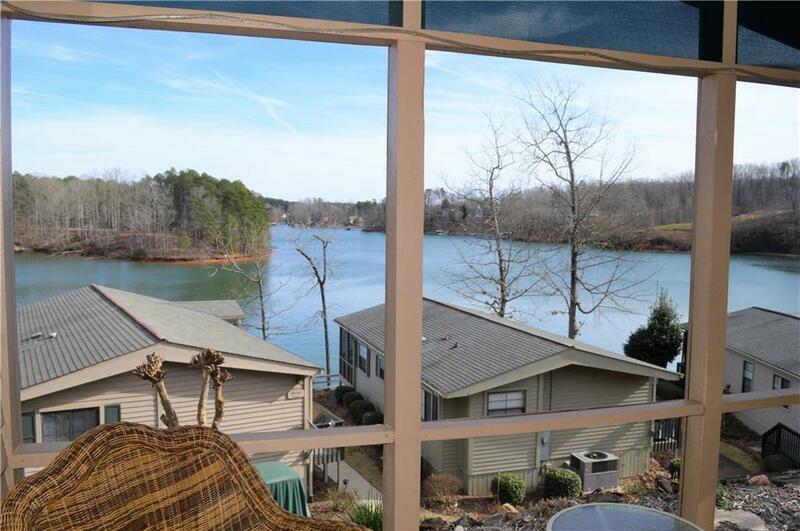 Great Value Lake Keowee Getaway! Fully furnished, including golf cart, ready for immediate enjoyment of the 2019 lake season. This turn-key cottage is located on the end right next to its assigned parking for added privacy and convenience. Open floor plan concept with a combined kitchen, dining and living area. A two bedroom, two bath vacationers delight with large picture windows featuring views over the lakeside. Extras include granite counters, plantation style shutters and level walk. Great for weekends at the lake, Clemson gamedays and year round lake fun! Community amenities include a fabulous 11,000sf lakefront lodge and swimming pool, marina, beach and walking trails. HOA includes landscape maintenance, private gate, water, sewer, trash service, pool, clubhouse, walking trails, fitness center and more. Modified tax structure add to the savings of this remarkable Keowee waterfront buy. ** Exterior tie up to dock can be rented for $15 a day for resident weekend use only (Friday-Sunday). Annual Boat Slip lease available as well as enclosed lakefront kayak storage and secure boat/trailer/RV storage. All features located on premises at a nominal fee. Please call Listing Office for details. ** A cottage worth seeing... schedule your appointment today! Copyright 2019 Upstate Multiple Listing Service, Inc. All rights reserved. Information deemed reliable but is not guaranteed. The data relating to real estate for sale on this web site comes in part from the Broker Reciprocity Program of Anderson Association of REALTORS®, Inc. and Upstate Multiple Listing Service, Inc. Information provided is for consumer's personal, non-commercial use and may not be used for any purpose other than to identify prospective properties consumers may be interested in purchasing. This site will be monitored for 'scraping' and any use of search facilities of data on the site other than by a consumer looking to purchase real estate, is prohibited. The listing broker has attempted to offer accurate data, but buyers are advised to confirm all items. Information last updated on 2019-04-20.